Okay I’m sure it should say ‘shoes’ and I’m definitely sure the quote doesn’t go like that but nevertheless the sentiment is 100% TRUTH. Being a makeup and skincare junkie/hoarder/obsesser, I spend the majority of my wages on creams and highlighters and scrubs and mascaras that will make me look like Khloe Kardashian (Khloe’s the favourite.) And I love it. I love the whole process of seeing reviews on a product, going out to buy said product, obsessing over the packaging and the blurb and how it’s going to wash away all my sins and instantly improve my life. I love unpacking it from my 5P bag and placing it on my dressing table in prime position ready to use and love and treasure. Forever. And then I LOVE being impressed. Being unimpressed is nothing on being impressed. Makes sense really. I love when a product does exactly what it says on the tin, like soothe and nourish. Yes I can feel the nourishment!! Like exfoliate and tighten. YES I can feel the tightening!! It makes it all worthwhile. So here’s a run down of my go-to skincare products that I really do turn to in my hour of need and every other hour of the day. 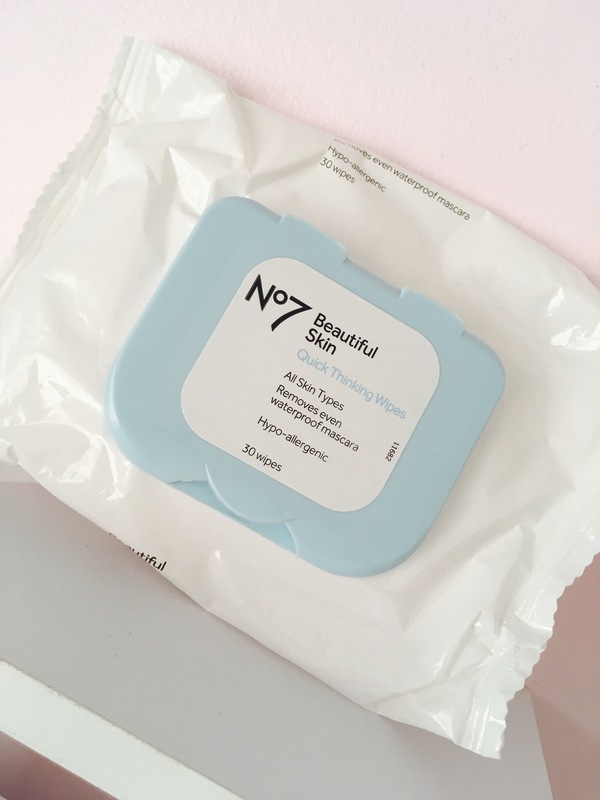 No7 Beautiful Skin ‘Quick Thinking Wipes’ – with makeup wipes I really am a fussy one. I always find that most wipes are too abrasive on my skin and most aren’t even wet enough to wipe away everything first go – therefore going through 3 packs a week for the sheer amount you use for one wipe off. Simple and Garnier Micellar wipes are a favourite of mine but these have been a recent re-occurring buy. I find these to be really moisturising in the sense that they’re really quite wet and for my skin being so sensitive, they tick all the boxes as they’re hypo-allergenic and filled with pro vitamin B5. The re-sealable lid is also handy to lock in the moisture of the wipes where in most cases you’re left with the top wipes always being a bit crusty because the sticker looses its stickiness. Absolute nightmare. The price of them is a bit steep at £7. I don’t really know what else is in the wipes for them to charge so much, maybe it is the £5 off skincare vouchers you receive with each Boots purchase which entices you to buy them and get them at the reasonable price of £2. Overall, for how sensitive my skin is, I do give these a two little thumbs up. 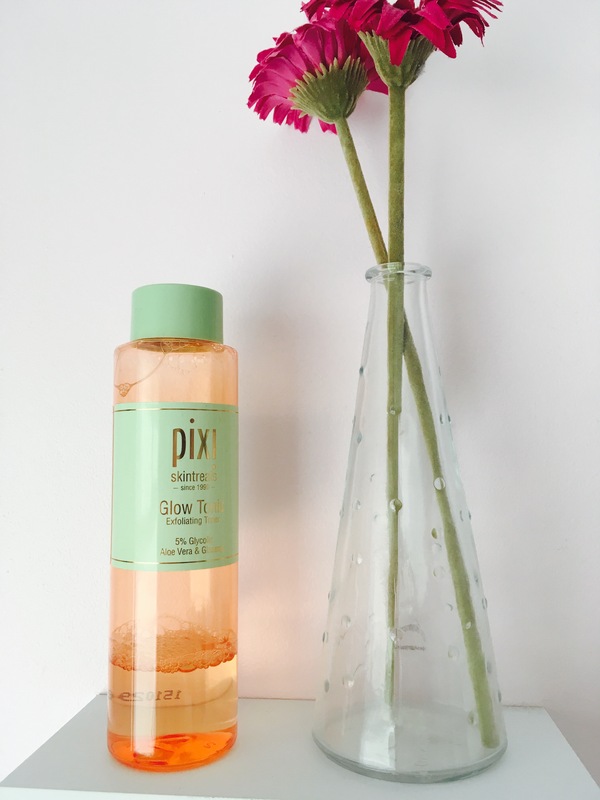 Pixi ‘Glow Tonic’ Exfoliating Toner – One word. LIFE. If there’s one product I recommend buying/investing in this year it’s the product right here. I’d even call it the holy grail. And what a statement that is. Now this is a product that does exactly what it says on the tin. And I get glowing results from it. (All the puns intended) You simply soak a cotton pad with this life changing elixir and sweep it all over your face neck and décolletage once you’ve cleaned/washed your face in the morning and at night and hey presto, you’re skin looks brand new. It leaves it soft and illuminated no matter what time of day. ANDDDDDDDD touch wood *knocks head* I haven’t had a break out since the day I started using it. Once again, it’s hypo allergenic and is great for sensitive skin. Especially if you have skin like me which is basically allergic to anything and break out in eczema at any given chance. The product does come with some safety instructions on the side, just ensuring that you use an SPF (as you should always do) after using as it contains an alpha hydroxy – basically increasing your chances of sensitive skin in the sun. N.B. – An SPF moisturiser or a foundation with SPF included is always an essential in a makeup bag. We only have one skin so best to look after it! With a price tag of £18 for a 250ml bottle, it may seem steep for a toner but the benefits are totally worth it. Even better, Asos sell it so take advantage of the 10% student discount! Garnier Micellar Cleansing Water for Sensitive Skin – basically a god send for sensitive skin, as the description on the bottle goes. Micellar water has had a popularity boost the past couple of years, with makeup artists back stage at fashion weeks adding to the hype as their ‘go-to’ makeup remover. For me personally I tend to use this product after I’ve already used wipes as its really good for getting the last few bits of residue makeup off my face and leave my skin feeling really fresh and soothed. One thing that I love is that its fragrance free and safe to use on eyes for all that no budge waterproof mascara and smokey eye you have going on. With the price tag of 4.99, it will last you a long time (I’ve had mine going on over a month now) – Garnier state that the 400ml will give you at least 200 uses. A little goes a long way and I recommend it to give you that extra fresh faced feeling after a long day! 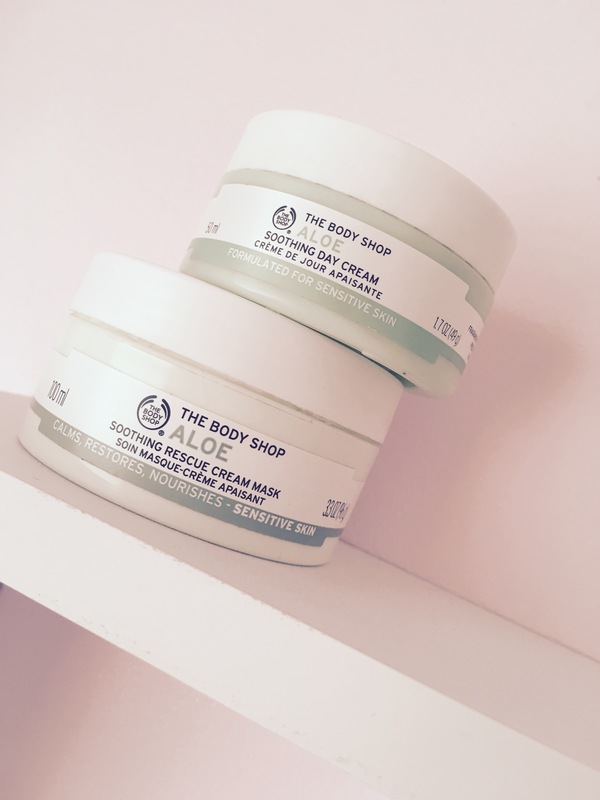 The Body Shop Aloe Soothing Day Cream – I swear down I’m not an advocate for The Body Shop but I have literally been in love with them the past couple of months. I suffer with eczema every now and then and it can spread to crazy places such as my eyelids and this Aloe Vera day cream has been an absolute life saver. The whole range is curated especially for sensitive skin therefore it’s fragrance, colourant, preservative and alcohol FREE. The product itself is not actually a cream formula per se, but more of a mixture between a cream and a gel and goes on so smoothly leaving your face soft and glowing. I find that most moisturisers for your face can be too thick and have a garish white colour to them which then leaves your face looking pale and washed out. It’s not the case with this product – it enhances your skins natural tone, bringing it to life looking nourished and fresh. £12.00 for a 50ml tub. At first the price put me off only because I was used to paying under £5 a moisturiser but you can use as little or as much as you want and I couldn’t start any day without it! The Body Shop Aloe Soothing Rescue Cream Mask – From the same range as the day cream I swear by, this rescue cream mask is another life saver. An intensive leave on mask, its recommended you only use it once or twice a week and that’s more than enough. After I have done the said steps above, I literally lather this on my face and it goes on like a dream. It just provides extra hydration for while you sleep which is when your skin does all its rejuvenating and jazz. Once again it’s fragrance, colour and alcohol free which is perfect for sensitive, itchy and red skin. Like mine. Winner. For £10 you get an 100ml tub and a little goes a long way. As the substance is pretty heavy duty (hence the once or twice a week application) you only need a little to get your moneys worth. A true gem. Thanks Body Shop. 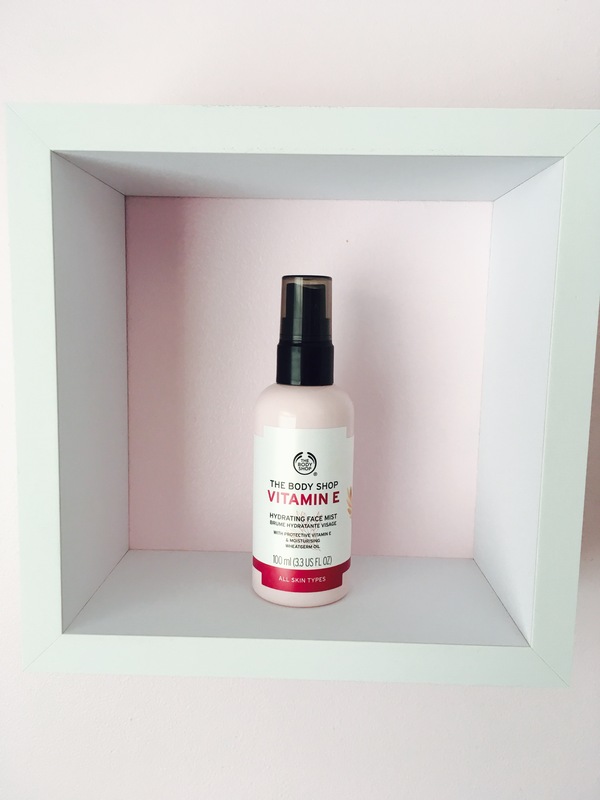 The Body Shop Vitamin E Face Mist – We live in a time where pollution is a big deal. And can cause havoc not only for the environment but for our skin. This facial mist is a great little skin ‘pick me up’ which I use when I have and haven’t got makeup on. The vitamin E protects skin from the signs of ageing and all things pollution whilst the wheatgerm oil gives your skin some moisture and hydration. I like to use it when I have a chill day with no make up and spray it throughout the day or for when I’ve just finished my make-up and it acts as a setter. Pretty much ticks the boxes for all events. For a 100ml bottle, the price is £9.50. Reasonable, as again, with most products in this list, will last you a relatively long time and so worth the money! N.B. All products mentioned are all available to buy at the present time. Prices may change/vary according to different websites/offers/discounts/dates.